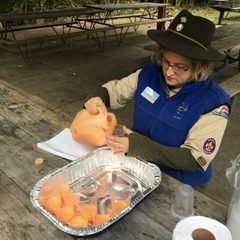 On Sunday, October 14th at the Cub World Pavillion on the Beaumont Scout Reservation, approximately 700 Cub Scouts entered an outdoor science lab weary from their haunted hike and created pumpkin guts and snot (aka orange or green slime). 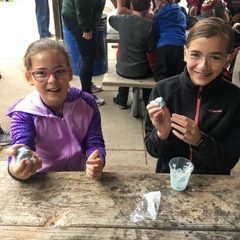 They learned about non-Newtonian fluids, and polymer chemistry, then worked in pairs to make their own slime, which they were able to take home. A total of 14 volunteers from St. Louis University, Washington University, ACS, and Troop 371 assisted with the event, which ran from 2pm to 9pm. More than 75 service hours were provided. 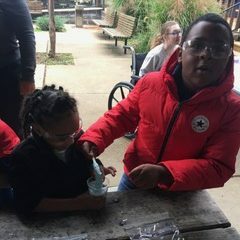 At least one scout cried when his mother made him stop playing with the slime and put it in the bag, and at least one adult commented that they now understood polymer science in a way they never had before.